Geek out with your pet over RoboBone. It is a robotic chase toy that is sure to entertain your dog while providing it some exercise. Plus it will get some treats out of playing with it too! Stuff the wheels full of your dog's favorite treat and watch ROBOBONE randomly spin around a room distributing treats as it goes. This motorized dog toy is meant to be used indoors with a design that allows it to move around freely without getting stopped or stuck. This is really useful on cold, snowy winter days when neither you or your dog want to go outside to play. RoboBone is programmed to run when its power switch is turned on for three minutes and then go into sleep mode until your pet wakes it up with a nudge. When reawakened, the toy will start a new two-minute randomized motion cycle to distribute more treats. Since it is meant to be used indoors, RoboBone will work on a variety of floor surfaces including carpet, tile, and wood. Plus for dog safety, it is made from durable non-toxic plastic materials with the electronics securely housed inside. Our Boxer LOVED playing with RoboBone! These Fat Cat items at first glance may seem like they are for felines but these toys with a funky sense of humor are meant for canines. FAT CAT® FOODIES pair the imagery of cats and tasty treats like donuts, tacos and pizza to create some funny looking dog toys made of durable polyester material. These toys include squeakers and floppability features to captivate a dog's attention and relieve your pets natural instinct for catching prey. Satisfying your dog's natural chase instinct while playing with the Chuckit! RingChaser. Dogs are sure to get some exercise while having fun chasing a durable ring designed to provide unique topspin infused action so that it erratically bounces, zig-zags, and hops across the ground mimicking the scampering actions of what a real animal would do if being chased. The Chuckit! RingChaser features a long, ergonomic handle with an easy pickup head that allows for a smooth throwing motion and slobber free pick-up of rings. For more information about these products and other doggy Christmas present ideas, please visit petmate.com. 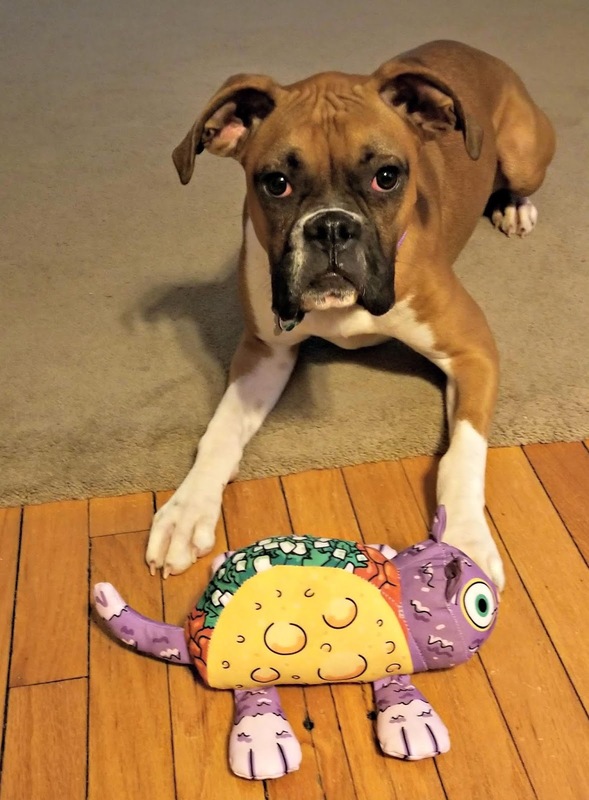 Thank you PETMATE for providing ageekdaddy.com with the featured products for my puppy to try out as the whole family has truly gotten a lot of enjoyment out of playing with them. 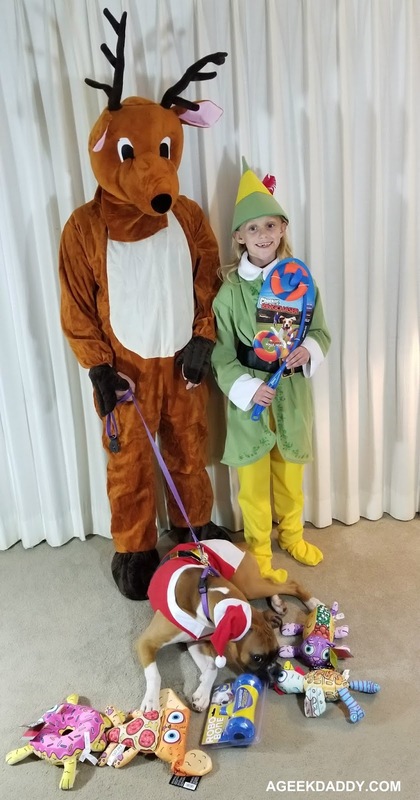 Also a special thank you to WHOLESALE HALLOWEEN COSTUMES who provided us with a Santa Dog, children's elf, and reindeer costume for this writeup. It doesn't have to be Halloween to have fun wearing costumes. 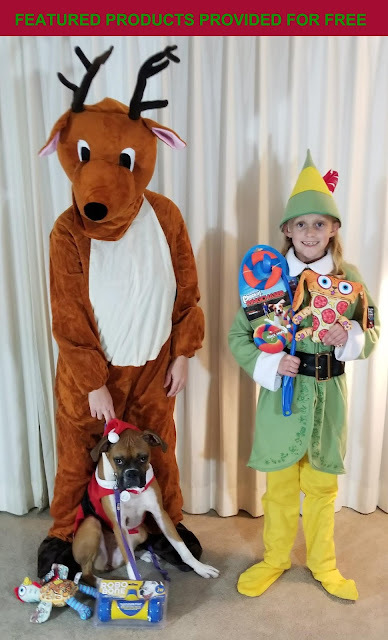 They have a great selection of bargain priced holiday costumes including Santa outfits ranging from dad to doggy-sized, as well as angels, snowmen, and toy soldiers. Have yourself a jolly time spreading holiday cheer wearing something from wholesalehalloweencostumes.com.